A very rare early re-release (1959) UK quad for MGM's charming classic. Judy Garland and Frank Morgan. Professionally cleaned, de-acidified and linen-backed. 30 x 40 (32 x 42 including linen backing). No restoration, tiniest wear on folds and very light staining bottom right margin. 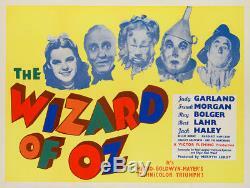 The item "Original The Wizard of Oz, UK Quad, Film/Movie Poster, Linen Backed" is in sale since Friday, September 22, 2017. This item is in the category "DVDs, Films & TV\Film Memorabilia\Posters\Originals - UK Quads\1970s". The seller is "orsonandwelles" and is located in Bath. This item can be shipped worldwide.